Promoting the common good through photography. It’s been a rough week for us, as we said goodbye to Mysti, our Shihtzu. Janet adopted Mysti in 2001, I met Mysti in 2006 when I first met Janet, and Mysti moved in with me in 2008 (even before Janet did!). I had recently lost access to my beloved Boston Terrier, Sam, so although I wasn’t really looking for a dog, Mysti came along at a good time for me. Here’s a pair of portraits from our last day together. Coming home from work, getting Mysti leashed up, and racing her down the driveway. It was a close race each day! Traveling with Mysti in the car was very easy… she was a good traveler! Both she and Janet would conk out during long drives… always made me smile. When Mysti really needed to go out or wanted to eat, she had a hilarious way of vocalizing her insistence that she be attended to immediately. She was the ultimate lap dog… practically feline that way. It’s a good time to recall Mugsy, who also started with Janet as a puppy, then spent several years with our friend Jon, and ultimately came back to us for his final months. Mugs was quite the character, and brought all the families he touched a lot of joy. Here’s one of my favorite images of Mugsy, always endearing even as he struggled with the ravages of time. Finally, a quick homage to Sam, who adopted the Swanson family in 2002. I couldn’t have asked for a better dog for my kids to grow up with. Too many memories to recount here, but here’s a couple favorite photos, including one from my son, Ben, as Sammy was in his final days. Is a privilege we all deserve. 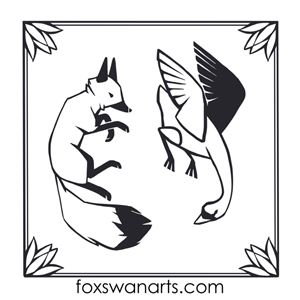 You can shop for greeting cards, framed art, and other Fox and Swan Arts products on our Shopify site. Click here!